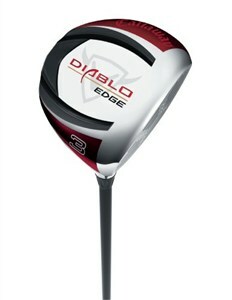 These Diablo Edge Fairway woods are going to give you at least 10 more yards than the woods you're hitting now. This is not a marketing pitch -- it's my honest review. The reason for the extra distance is the hot face. It's an ultra-thin VFT face. This technology creates faster ball speeds with more consistent distances. The other thing I like about these sticks is the high MOI. It has a four-piece modular design that moves the bulk of the weight to the back of the club. Every piece of the club is precision-formed and fused together to give this club an extremely high MOI and a low center of gravity. The one thing I don't like about the woods is the sound. It makes a high pitched "TING" noise, which a bit obnoxious. Of course, I can get used to it if my ball is flying straight and reaches the par 5 in two. For Callaway's latest and greatest advance in technology, make sure you check out the Callaway Diablo Octane Fairway Woods. Callaway joined with the car company Lamborghini to come up with this cutting-edge material that is even lighter than titanium.